And NOT one you can play water polo in! Garden drainage troubles can be a nuisance, especially if they are spots that stay soggy for several days after a deluge. But then, you KNOW you've got a problem! When these puddles remain on the surface for long, water is absorbed into your plants and grass, over hydrating them. These small ponds may then freeze, and the life giving cells in your plants can burst, thus killing them. Dead grass is not a good look for your landscape! Depending upon the situation encountered, there may be a number of potential solutions for these garden drainage problems. If you are lucky enough (or SMART enough!) 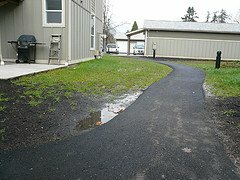 to find out about your drainage issues before your landscape is installed, you may be able to easily re-grade your soil and remove this issue altogether by more carefully sloping your yard just slightly away from the house and encouraging water to drain toward an existing storm drainage system. Your property surface should slope at approximately an inch per foot near the house to carry water away from the foundation. This will help to keep water from pooling around your foundation. If your garden drainage tribulations are discovered on an existing property, or develop over time due to settling of the soil, this solution may be more costly than is reasonable. In these cases, other less expensive and more localized solutions may be desired. One potential solution is to add soil to the low spot and attempt to raise the level in those spots so that they no longer collect water. This may work if the problem is truly due to uneven grading of the soil surfaces. However, in many cases this will do no more than alter the location of the wet spot. We’ve already discussed area drains and channel drains as solutions for situations where heavy clay soil or compacted soils cause drainage issues. These solutions may also be employed here to resolve localized low spots of your landscape. 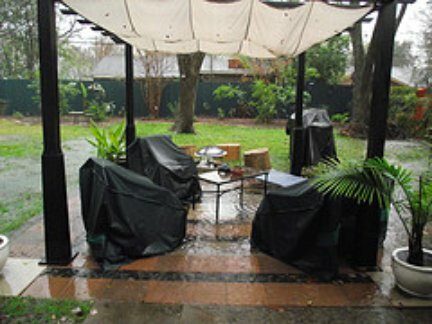 For larger areas plagued by garden drainage problems, a system of drywells and soakaways may also resolve the issue. 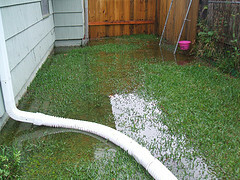 But for the toughest landscape drainage issues, you may need to install a French drain or underground drainage system. A French drain is a system where a trench is dug at a slight slope away from the area that needs draining. It is designed to direct surface water to areas that can handle the drainage burden, such as storm drains or water collection systems. These collection systems may be dry wells, soakaways or existing storm drain systems. 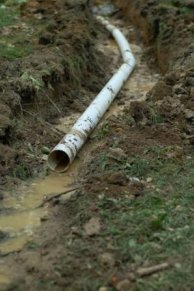 trench and the pipe is generally wrapped in a water permeable landscape cloth, to help manage silt deposits and lengthen the life of the drain system. The trench is then covered with additional rock or gravel, and left open to the surface. For more about how to build a French Drain, watch this short video by Landscape Nashville which does a great job in a few minutes of showing you how it is done! If a French Drain design is carefully conceived, it can be an attractive addition to your landscape, as well as a functional one. 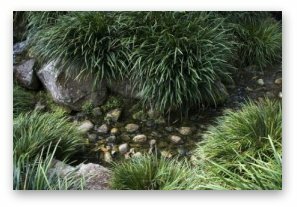 It can be treated as a dry stream bed or dry creek by adding plantings along the edges, adding more stone to create natural curves and adding larger stone to mimic nature. Treated in such a fashion, they become a real design asset. The alternative to French Drains is an underground water drainage system. Size matters here! If the area of your property to be drained is a small to intermediate size, you are likely to be able to do the job yourself and do it well. But if the area to be improved is significant in size, it is, in most cases, a better practice to obtain a garden drainage contractor.